The dynamic and engaging benefits of LED video displays work for all kinds of environments. Many churches were early users of video technology by incorporating large projection screens in their sanctuaries. Unfortunately, projection technology was only effective for churches with a “black box”, theater-like design, meaning that outside light levels had to be controlled for the best viewing. Today’s LED video displays allow even well-lit churches to use multimedia services to engage and inform their congregations. 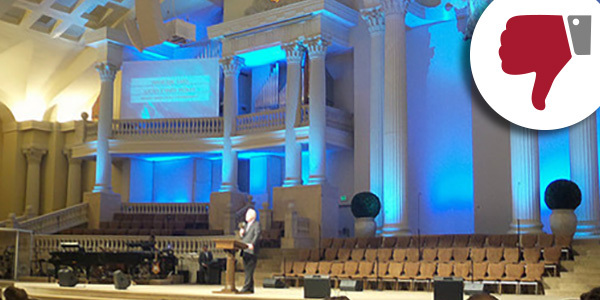 That’s why many houses of worship are choosing LED video walls to replace outdated projectors. LED displays look good in ambient lighting, have vibrant color and great viewing angles, making them ideal for church programs. 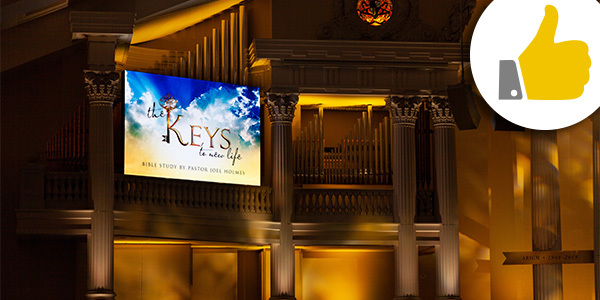 Here are just a few ways that churches benefit from incorporating LED video walls. Projectors work best when light is projected on a screen. Everything in the environment can impact the quality of image, from sunlight coming through windows to the whiteness of the screen, the distance from the projector, and the age of the system. In fact, a projector can lose up to 30% of its brightness in its first year of use. LEDs emit direct light. That’s why Watchfire LED video walls look great in every lighting condition. LED displays have the same vibrant brightness whether it’s under fluorescent lights, next to a stained-glass window or in a sanctuary with a lot of natural light. Projectors need to be adjusted, right out of the box. To get the right flesh tones, you’ll need to adjust the black level, white level, saturation and hue. Projector presets like “cinema” can be useful starting points, but these presets are calibrated for the content being shown without considering your church environment. This means you’ll have to guess the proper color correction and will probably need to readjust frequently. Some churches do this once a year, while others adjust every week. Watchfire has pioneered a proprietary process that color calibrates our displays pixel to pixel, module to module and across the whole display before it leaves our factory. After calibration, a Watchfire display is 70% more uniform in color compared to other LED display manufacturers. When video lacks the contrast that comes from a deep black color, the content looks washed out. With a white projector screen, black levels are largely determined by how dark the sanctuary is. The background of an LED display is black. That means the display is manufactured to have greater contrasts and richer looking colors. Even in full sunlight, a Watchfire display has vibrant, saturated colors that are easy on the eyes. High Definition (HD) video is standard on most screens today. We see it on our televisions, phones and computer monitors. It offers a crisper, more detailed video than standard definition (SD) video. Most projectors support SD video and don’t display HD images at their full resolution. Watchfire LED digital displays support HD technology in videos and other outputs like PowerPoint or ProPresenter. Less expensive projectors were not built to last. Clogged cooling channels, broken fans and overheated components can result in melted lenses or parts and repair costs are often higher than the original price of the unit. More expensive projectors can last longer. With proper, regular maintenance and a dust-free environment, an expensive projector can last several years but will require lamp bulb replacements. The average projector bulb lasts only 2,500 hours. Watchfire video displays are engineered to be hassle-free. We simplify connections and use quality components to boost quality and reliability while reducing the opportunity for failure. Watchfire proudly offers a five-year gold-star warranty and guarantee that we will continue to support our products for at least 10 years from the date the last model ships. Plus, a Watchfire video display set for an appropriate indoor brightness level can last for over 100,000 hours. A projector the lamp would have to be changed 40 times to last that long. LED walls can cost slightly more than projectors of a similar size and commercial quality. However, projectors have parts like bulbs and light engines that can require replacement every few years. A new bulb can cost up to $4,500. As a rule of thumb, if you’re considering a projector in the 12-14K lumen range or higher, you should consider an LED wall instead. Many churches find the break-even point occurs in the first year or two. 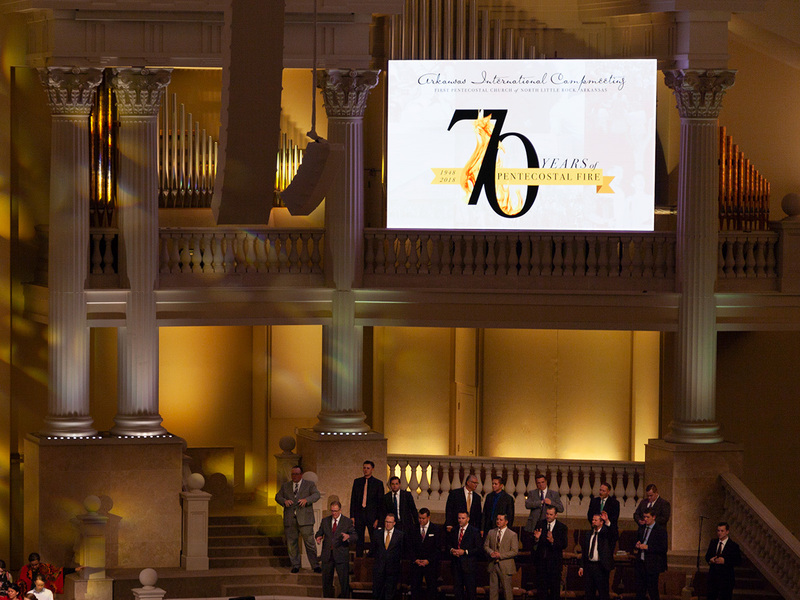 Costs are ultimately secondary to the real goal – having a multimedia experience that enhances your message and service, without comprising the look and feel of your house of worship. Choosing an LED video wall from Watchfire can give you look, reliability and sound investment you want.